The Maltsters can be found in the picturesque village of Ranworth. Just across the road from The Maltsters is Malthouse Broad, a short walk away from here is a boardwalk which leads to the Broads Wildlife centre. Ranworth has an impressive village hall and the church in the background is definitely worth visiting, you can climb to the top of the tower where you're rewarded with stunning views. 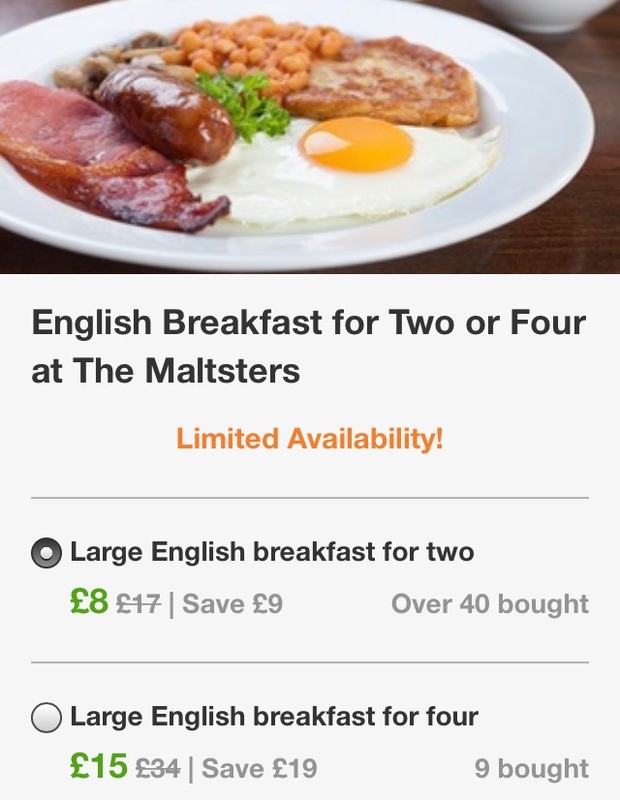 The breakfast at The Maltsters was the reason for our visit. The interior is modern and spacious, we considered sitting here by the window but the bright sunlight was a bit too blinding. We decided instead to sit in this area at the back of the pub. The offer has most likely expired now but we were lucky enough to use this Groupon offer and got two breakfasts for just £8! Tea cost £1.80 for a cup, in breakfast situations I do prefer a pot though. Quality sauces arrive in a basket with the cutlery, a selection of preserves and butter are served on a side plate. It's a big breakfast and everything was piping hot. They'd run out of mushrooms which was a great shame, an extra hash brown was added to make up for this. 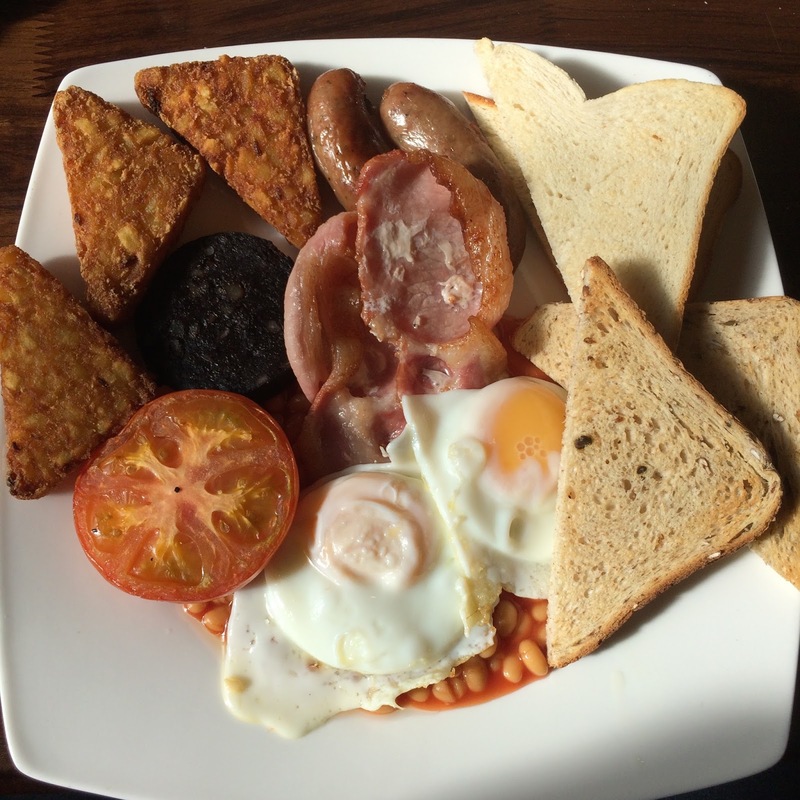 Quality meat is served on this breakfast, black pudding is welcome on my plate anytime. Not the tidiest looking eggs but the yolks were intact. The yolk flowed beautifully when I cut through them. A big tomato with very little flavour. A trio of very crispy hash browns, nice and fluffy inside though. No bread dilemmas here, you get brown and white toast. My wife's vegetarian breakfast, an extra sausage replaced the missing mushrooms. My wife forgot to ask for no eggs on her vegetarian breakfast so I helped her out and ended up with four! Veggie option - 2 vegetarian sausages, 2 eggs, 2 hash browns, mushrooms, beans, tomato, 2 slices of toast served with butter and preserves. £8.25. Your wife's veggie one looks good. Can't say the same for yours, with those weird white pasty bits on the bacon (what are those? I remember finding them often, when I used to eat meat). Probably best not thought about, as with most things to do with meat! Thats just where the salt and meat juices have combined, perfectly harmless. Descent brekko, I thought the hash browns looked a bit too crispy but as you say they were fluffy then its all good. The toast definitely needs a tad longer though, very anemic.